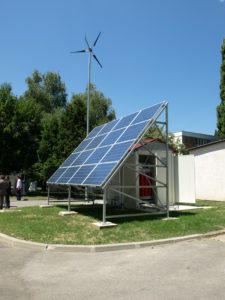 The autonomous power supply system is a self-contained system integrating various devices for generation of electricity from renewable sources (wind turbines, photovoltaic cells), energy storage in batteries, hydrogen tank and fuel cells for the production of electricity from hydrogen, as well as protection, measurement, and control systems. The system has built-in communication with remote users and provides monitoring of various parameters, warnings, and alarms. Depending on energy needs of the location, and the wind and solar energy resource potentials, the configuration of an autonomous power supply must have an appropriate number of wind turbines, photovoltaic cells and an energy storage system of appropriate capacity. Energy storage consists of batteries and hydrogen, which serves as an auxiliary source of energy if it is not possible to generate energy from the wind or the sun and if the batteries are empty. Končar – Institute’s Hybrid Box® is composed of extremely rugged, commercial-off-the-shelf (COTS) components. It is a simple, user-friendly, plug-and-play hybrid power system plus a shelter, designed to provide reliable power in harsh environments. The design provides a durable, climate-controlled shelter for the customer’s equipment (optional), and provides shelter for the electrical system components of the power plant (battery bank, charge controllers, etc.). To provide the most cost effective solution, systems are designed to provide power with an extremely reliable hybrid renewable power system, utilizing input power provided by solar, wind turbines (if applicable), a battery bank, and a backup generator to maximize the value and efficiency of each.